Have you ever wondered how Polynesians and other Pacific Islanders interacted linguistically with Europeans in early colonial times in Hawai‘i? Conventional wisdom has these islanders and newcomers using some form of Pidgin English. However, there exists no convincing historical evidence for such an assertion until an entire century after Capt. James Cook’s arrival in the Pacific. So how did Cook — and those who followed in his footsteps — verbally communicate with Islanders? 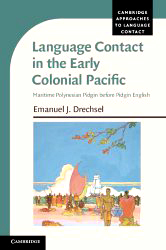 Answers to these questions emerge in a new book, Language Contact in the Colonial Pacific: Maritime Polynesian Pidgin before Pidgin English, by Dr. Emanuel J. Drechsel of UH Mānoa’s Interdisciplinary Studies Program. Published by Cambridge University Press, the book includes a website vocabulary of some 60 pages. Historical research reveals that a reduced Tahitian, reduced Māori and reduced Hawaiian that were grammatically much alike and mutually intelligible and that merged into a regional contact language termed Maritime Polynesian Pidgin. 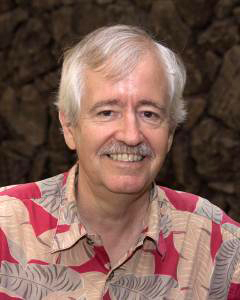 According to Drechsel, Europeans then learned and employed such a reduced form of Polynesian while communicating with Islanders of the eastern Pacific during early colonial times, rather than imposing English or some other European language on the Islanders. [at the] house [of the] chief [who-is-] small or [the] captain? Drechsel believes Maritime Polynesian Pidgin operated as the major interlingual medium in European explorations of the Pacific when the uninvited visitors required new resources such as fresh food and water, repairs to a damaged ship, navigational assistance and replacement of crewmembers who had jumped ship. It also served in later trade (especially that of maritime fur, sandalwood and pearls) as well as in whaling and sealing, beachcombing, and the service of Māori, Society Islanders and Hawaiians on European and American ships.